We Shall Die For Metal! Horns Up Brothers! so this sight has the power metal fans from all over the world, here in florida, usa, there is way no damned thing as a metal station, not by a far sight. one garbage radio rock station here were im at so i can listen to the same metallica, green day, guns and roses, etc, etc, i've been listening to my whole life. (garbage to me at this point). but i've heard speak this is not the case in europe, where it is nothing(i've been told) for nightwish, sonata arctica, iced earth, blind guardian, etc, etc, to come on the radio. so tell us all about the garbage or greatness being broadcast to you and yours. i realize that the digital age is upon us and things like satellite radio and the gaining popularity of mp3 and like formats is making it easyer but we all still get stuck listening to the radio at some point. You get Metallica and GNR? The UK radios here are full of crap like R&B and Rap. There is a station called ROCK FM, which might as well be R&B FM, because it has never played one rock song. It's disgraceful. 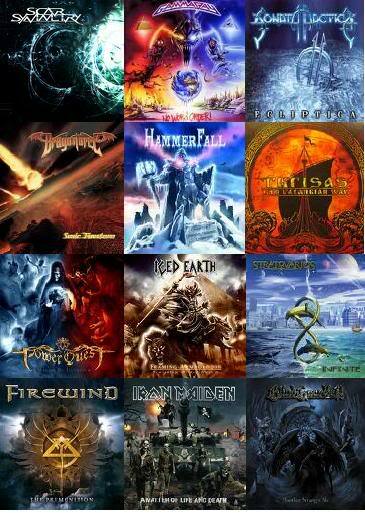 I hope somebody eventually comes up with a metal radio, or in particular a Power metal radio. Wouldnt mind Blind Guardian or Dragonforce blasting in the ride! and I heard nor sigh nor groan. There's radio in the UK?? I thought it was just a random noise?? yeah, the radio is terrible here too..
We have a pretty good rock radio in Hungary. They don't play Power Metal but at least they always play rock/heavy metal......too bad they have a sport news section every hour for about 20 minutes.....like a whole lot of things happen in one hour. I seem to recall a halfway decent station in Florida. (Perhaps near Pensacola? )....Better than anything in Alabama. People from the UK seem to be leaving out Bruce Dickinson's 3 Hour radio show, dedicated to Metal on fridays! Also Kerrang plays more metal on the radio than on the TV station, they have Maiden Hours, Metallica Hours, Heavy Metal Happy Hours, everything and we've also got Planet Rock who play a lot of Classic Metal too like Deep Purple, Priest, Maiden, Metallica, Megadeth, Sabbath and bands like that. Then there is Virgin Radio who play, well classic rock but yeah, there's a few, you just need a DAB radio or tune in to BBC Radio 1 on Fridays at like 9pm. Yeah like heaymetalradio dot com. I like that. You can even request songs. I'm so impressed by Pont FM. We were cooking gingerbread (that's so metal) and I turned on the radio and they were playing POWER QUEST!!!! Don't know which song though. Yeah Bruce's 3 hours are pretty cool. He's talking to Judas Priest on the 13th Feb! Can't miss it! Oh btw it is on BBC Radio I think, Fridays at 21:00 to midnight. There are some stations which can play rock occasionally but its rock like kaiser cheifs, keane, foo fighters ect. Metal music here is shamed on by the music industry powers and very much forced underground. Last year the council in Leeds formed a plan to send even the fans of metal music underground by turning an alternative shopping circle (corn exchange) into a food court. they then gave somewhere for the alternative fans to go by forming a during the day gig where bands could play and the fans could hang out. even the venue was underground haha! I have a friend who works fairly high up for the leeds council, she was in a conference when they were discussing the subject. They were even saying things like "these dirty moshers are ugly and are bringing the city down with them with their dirty image". Sorry for the big story but yeah england is not the metal haven you thought it was unfortunately the fans are on their own to keep the metal alive here, no form of mainstreme media will even recognise the existance of metal. Fortunately England does have a very dedicated metal fanbase which means once small festivals like bloodstock have turned into worldwide metal attactions. We did lose prog power unfortunately because of the lack of interest but prog metal here is near on hated by the metal community, sad but true unfortunately. If you have ever been to germany however it is quite different there. We (dreamcatcher) had a short explore around hamburg before getting the bus to wacken and there are metal posters even in the street! I saw a scar symmetry poster, nuclear blast and an after forever poster all on one street! I have heard in Finland its even better! All we can do is support the online metal stations. Their are some really good ones, check out Progulus and wykkyd bry Radio. Maybe one day PMLO will do its own pre recorded powermetal shows hint hint lol. Just think.... it could have interviews and powermetal news and everything! hehe i think you guys could pull it off, you do have a very successful youtube channel maybe you could use that for the interviews! WTF IS IT? KILL IT WITH FIRE!!! and how do you propose this is done? Jump to: Select a forum||--The Metal Kingdom| |--General Metal| |--Power Metal Bands| |--Other Metal| |--Metal Polls| |--Upcoming Shows/Concerts| |--New Albums| |--Metal News| |--Bands Info Area| |--Share The Metal| |--Album Reviews| |--Shows/Concert Reviews| |--Off Topic Area| |--Off Topic (Anything)| |--Off Topic Polls| |--Bands/Artists You Dislike| |--Up And Coming Bands| |--YouTube| |--PMLO Gaming Clan| |--Forum Games| |--Debates| |--Special Archives [View Only] |--Power Metal Christmas Fun With TCJacko! Should we move to our own server? » Where are you guys? » Bloodstock Festival 2013! Who's going this year?